For babies and children play is hard work. What may seem like fun, cute or even silly activities to adults are really the ways in which babies and children learn about their world. Through play, babies and children explore their surroundings, understand their place in the world, develop physical, cognitive and emotional skills and learn social cues to practice their social skills. Through play, babies and children take in their surroundings including where they are, what objects surround them and what people interact with them. As they play in these surroundings, babies and children start to put things into patterns and develop their own schemas of their worlds. As babies become toddlers and thus more mobile, they can literally explore the world on their own two feet. At this point babies and children understand that they are individuals and so can also begin to sort through their place in the world and their particular surroundings. Babies are born helpless and must grow and develop to the point that they can control their muscles and do things for themselves. 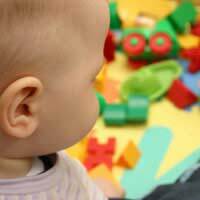 At birth infants can’t even hold their own heads up, but through play they will master this skill and more. Babies and children use play to work with all of their muscles, which means that play helps them develop gross motor skills (controlling their large muscles) and fine motor skills (controlling the smaller muscles of their hands and feet) as well as general coordination and balance. Cognitive skills are those that relate to thinking and learning. During play babies and children develop their cognitive skills as they are introduced to new objects and must sort them, as they learn their colours and numbers, as they learn to identify like objects, as they learn to understand rules and much more. According to theorist Lev Vygotsky, children learn best in a social context, so play with parents and other children is especially important for cognitive development in babies and children. Emotional skills are those that relate to recognising and working with one’s emotions. At birth, babies’ emotions are closely linked to their needs so they will become upset when hungry or wet, but as they grow babies also become closely attuned to the moods of their caregivers and so become upset when the adult is tense. When babies become toddlers, they begin to recognise themselves as individuals with their own moods and emotions and can even become manipulative with them. Through play, babies and children can come to understand their emotions and how to use them and contain them as their society deems fit. Most babies and children will play at the very least under adult supervision, but more likely with an adult or another child. These play activities then become opportunities for babies and children to interact with others and learn the societal rules that govern these interactions. For example, babies and children will learn that sharing and taking turns are encouraged, but that stealing and kicking are not. Offering babies and children opportunities to test and hone these skills is especially important.The benefits of play for babies and children are myriad. Play offers babies and children the opportunity to explore the world around them, to formulate an idea of their place in the world and to develop physical, cognitive, emotional and social skills. Clearly, play for children is actually tough work! Thank you for the information.It was very useful for my project. Good job, helped with my presentation for parents of 0-3 year old. Thanks.